Moving on to Medicare after a lifetime of insurance through your employer can be a scary thing. We sometimes meet people who have unnecessarily double or even triple-insured themselves. It’s usually done out of anxiety over how Medicare will cover their healthcare needs. Some will even ask us – is Medicare good or bad? Well, I’ve worked with Medicare-related insurance products for many years now. I’m happy to report that Medicare combined with the right supplemental insurance is some of the best coverage you will ever have. I wish I could buy it myself. Approximately 91% of all physicians participate in Medicare. This is over 800,000 healthcare providers for you to choose from. This is far, far larger than any other network you have ever been covered by. In addition, if you choose to enroll in a Medigap plan, you can continue to use all of these providers. It doesn’t matter which insurance company provides your Medigap coverage. Let me say that again because it’s important. With Original Medicare and any Medigap plan, you can see any doctor that takes Medicare. It does not matter who your Medigap insurance company is. 2) Is Medicare Good for People Who Travel? Many retirees these days travel extensively. Some may even live part of each year in two different states. This is more common than ever with global families. We have a number of clients here who live several months every year in another state to be near children and grandchildren. Since traditional Medicare is a national program, you can see physicians in both states with no problems. Likewise, if your supplemental insurance is a Medigap plan, that plan will pay after Medicare no matter where in the U.S. that you are receiving care. (Medicare Advantage programs, on the other hand, often have smaller local networks and care received outside of your local area may or may not be covered depending on your plan benefits. Do not join a Medicare Advantage plan without looking into this and ensuring that you are comfortable with your travel benefits). If you have been covered by an HMO plan in the past, you know that sometimes having to get a referral from primary care doctor in order to see a specialist can be a real pain. On traditional Medicare A & B, you can see any specialist or provider who accepts Medicare – referrals are not necessary. While certain services require prior authorization under Medicare to ensure you get the most coverage, the flexibility of choosing your own providers within Medicare is a terrific benefit. For serious illnesses especially, you have the ability to see more than one specialist, or to see out the best specialist for your health condition, without having to obtain a referral. So if having no referral requirement is important to you, choose Original Medicare instead of a Medicare Advantage plan. Did you know that if you enroll in a Medigap Plan F, which covers all your deductibles and coinsurance, you will essentially have first dollar coverage? This means that for any covered services, your coverage pays right from the first dollar due. You will have no copays for any Medicare-covered services. Go to the doctor? No copay due from you. Spend 3 days in the hospital? No deductible to pay. Expensive MRI? Covered! What about chemotherapy? Won’t cost you a dime. As long as Medicare first pays its share, your Medigap Plan F will then pick up the rest. Your Medigap plan cannot refuse to pay its share on a bill that Medicare has approved. That being said, you should know that in 2020, Medigap Plan F is going away. New enrollees will no longer be able to enroll in it. So many people are opting for Plan G these days. It works just the same as Plan F except you pay the Part B deductible once per year. Premiums are lower than Plan F though, so you usually come out ahead. This can be especially important in states like Florida, where Medicare supplements are particularly expensive. Rates around the nation vary based on the cost of healthcare in the local area, so sometimes your plan decisions will be affected by what rates carriers have to offer in your area. 5) Is Medicare Good about Pre-existing Conditions? People with a serious or chronic health condition often fear transitioning to Medicare. They worry that their pre-existing conditions won’t be covered. Fortunately, that is not the case. When you activate Medicare Parts A & B, there is no waiting period for treatment. Be sure to enroll in a Medigap plan within 6 months of your Part B enrollment date though, to ensure that your supplement will do the same. If you already have Part B and are leaving your group health insurance plan, there is a similar but shorter guaranteed issue window where you can enroll in Medigap without fear of pre-existing conditions being excluded. Let me give you a real life example. Several years ago I received a call from a woman who was very ill and losing her group health insurance coverage because she could no longer work due to her illness. She was literally crying when she called our office because she was so scared. She had also just turned 65 during the prior month. When we helped her enroll in her Medigap plan, she had an IV rack with her from which she was receiving fluids. She had further chemotherapy scheduled the next day. We assisted her with getting Medigap Plan F coverage in place the following day. She was immediately approved. All of her further cancer care was covered. That’s how powerful the Medigap open enrollment window is for you! 5) Is Medicare Good for Preventive Care? Back in the day, Medicare used to only provide benefits for injuries and illnesses. People had to pay out of pocket for an annual physical unless they purchased a Medicare supplement that included a benefit for an annual check-up. In recent years though, Medicare has learned that proper preventive care can save the government a lot of money by catching illnesses early on. So they ahve added a whole host of new preventive care services. Medicare now offers free screenings for diabetes, cancer, glaucoma, aortic aneurysms and cardiovascular conditions. Other services are yearly wellness visits, bone mass measurements, flu and pneumonia vaccines. People who use tobacco can take advantage of cessation counseling, which includes up to 8 sessions of therapy as well as nicotine patches in some circumstances. Considering that prior to 2010, Medicare didn’t cover even an annual physical, the preventive care benefits are very good today. We also shouldn’t forget that for 40 years there was no drug coverage in Medicare. Today we have Part D as a voluntary option for anyone who needs help with retail outpatient medications. There are better discounts on medications for people on Part D who experience the coverage gap, and due to the recent Bipartisan Budget Deal, there will be no more coverage gap in Part D as of January 1st, 2019. So is Medicare good or bad? All in all, it’s pretty great. While no program is perfect, we see people here all the time who are spending over a thousand dollars a month on Cobra benefits. 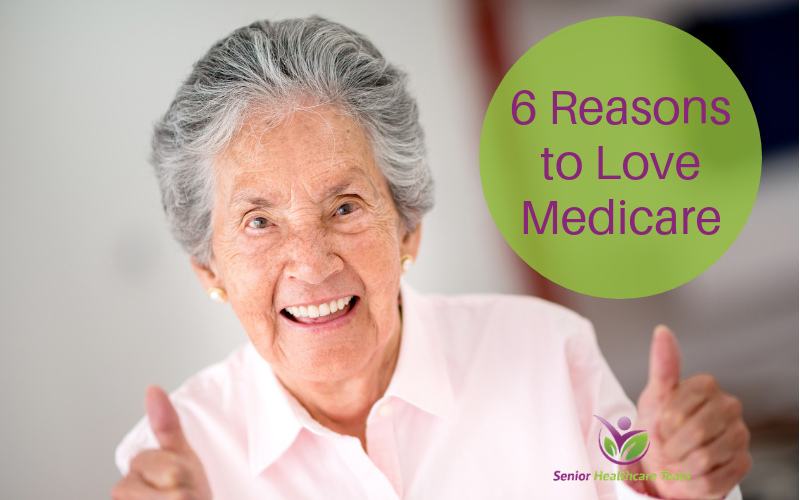 Transitioning to Medicare is a relief for them. Medicare Part A costs nothing for most people and Medicare Parts B and D are reasonably priced. Selecting the right healthcare plan through Medicare can be overwhelming and downright stressful. Senior Healthcare Team is a nationwide resource that provides guidance and support about Medicare to seniors at no cost to them, and helps them to choose the most suitable insurance plan tailored to their specific needs and budget. Our goal is to educate and empower our clients to make the best decisions regarding their healthcare and clear up the confusion of Medicare. At Senior Healthcare Team, we aren’t partial to any one insurance company. Our loyalty is to our clients and our mission is to provide them with the best healthcare options at the very lowest cost.